Gotham City is no stranger to...tricky relationships. Batman and Catwoman, Nightwing and Batgirl, Harley and the Joker… You get the idea. Those crime fighting (or crime causing) couples that can never seem to decide if they love or hate each other. Well, make room on that list for another set of names. Tim Drake and Stephanie Brown burst into Rebirth with their relationship revived and more complicated than ever before. With Tim missing (you can read all about that in DETECTIVE COMICS VOL. 1: RISE OF THE BATMEN) and Steph trying to sort out her place on the team, things are a bit of a mess for them, romantically. You can catch up with Steph as she tries to process her next move in the most recent Detective Comics collection, DETECTIVE COMICS VOL. 2: THE VICTIM SYNDICATE, which is on shelves now. As you can imagine…it’s complicated. So, with that in mind, let’s try and shine a light on some pieces to the puzzle that is Robin and Spoiler by taking a look back at the rocky road Tim Drake and Stephanie Brown have traveled to get where they are today. Back in the earliest days of his time as Robin, long before he picked up the Red Robin moniker, Tim Drake was a struggling high school student doing the best he could to balance his secret identity and crime fighting activities with keeping up his grades and maybe having some semblance of a normal social life with friends who don’t swing around from gargoyles in the middle of the night. As part of that balancing act, Tim found himself embroiled in a sort of secret identity love triangle that was just as awkward as it sounds. As Tim Drake, the high school student, he was dating a classmate named Ariana who had no idea about his second life. As Robin, however, Tim was seeing a fellow vigilante who called herself the Spoiler. ...Or, well, Spoiler thought she was seeing Robin. Robin was predictably kind of unsure about the whole thing. 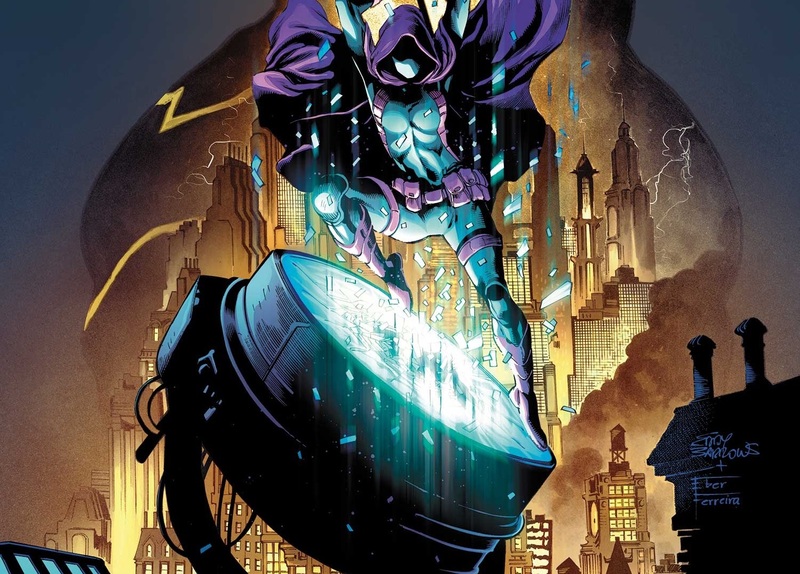 Also, he just so happened to be a person trained by the World’s Greatest Detective, so it didn’t take long to figure out that Spoiler was indeed Stephanie Brown. Steph, of course, did not have those resources at her disposal, so she remained woefully in the dark as to who Robin was behind the mask. That didn’t slow her down, though. The earliest days of Steph and Tim’s flirtation were a hilarious game of cat and mouse with Steph doing her share and then some of the chasing. She even wrote extensive entries in her diary about how dreamy Robin was, all while Tim struggled to figure out the right way to proceed. After all, this was far before Steph had been officially adopted into the Bat family, so it wasn’t as though Tim could take his mask off and tell her everything—and the matter with Ariana back at school wasn’t exactly an easy issue to solve, either. Tim tried to loop-hole his way through the secret identity problem and date Steph in earnest by meeting up with Steph out of costume in a civilian cover identity he invented for himself by the name of Alvin Draper. It worked for a while, but was about as awkward (and hilariously 90s) as you can probably imagine. Eventually, Batman himself had to step in to end Tim’s crisis. But, in typical Bruce Wayne fashion, he didn’t bother to let Tim on his plan beforehand. In fact, the violation of trust drove a wedge so far between Robin and Batman they actually stopped working together for a bit. Meanwhile, Tim and Steph’s relationship took a turn for rougher roads…especially as Bruce began to have Steph take up training under the Birds of Prey. Who would have thought that it would be pretty uncomfortable to hang around your girlfriend who’s working closely with the boss you’re currently mad at? Don’t worry, soon enough those rifts were mended and everyone reconciled...for the most part...for a little while. The good days were great but the bad days were worse. Steph’s constant fear of being seen as incompetent by the rest of the Bat family versus Tim’s perpetual anxiety about not being strong enough to protect the people closest to him made for a pretty volatile combo when things got shaken up. That pressure would eventually boil over the day that Tim’s father found out about his second life as Robin. It wasn’t pretty. Tim eventually gave up the mantle rather than put his father through any more lies, but losing his life as Robin put he and Steph’s relationship through even more strain. Steph eventually decided to take matters into her own hand and become Robin herself in Tim’s stead. After all, Tim got the job by declaring that Batman needed a Robin, so who was she to argue with that logic? For better or worse, Bruce agreed to give Steph a trial period as his new sidekick. It went well...until it didn’t. Steph’s time as The Girl Wonder was cut short abruptly, and just in time for Gotham to spiral into the chaos of WAR GAMES. War Games came to a close with Steph nearly beaten to death by Black Mask and spirited out of the country with the help of Dr. Leslie Thompkins after everyone in Gotham believed she’d succumbed to her injuries. But don’t worry, the story doesn’t end there. One faked death and some serious time spent growing up and maturing independently from one another gave Steph and Tim some much needed new perspective, and, when Steph was eventually clear to return to Gotham several years later, the two of them decided to pick things up as close friends before jumping into anything more. ...No really! Be careful reading further if you haven’t read through Detective Comics Vol. 1: Rise of the Batmen. It was Rebirth that kickstarted things between Tim and Steph all over again in earnest. But even newly renewed, their love story was anything but smooth sailing. Between the pressure of Batman and Batwoman’s “boot camp” and Tim’s recent acceptance to a college that would ultimately force him to retire from the super hero scene, there was almost no time for planning for the future in a romantic sense. Which turned out to not matter all that much, because, well...Tim’s life took a turn for the worse not long after he’d told Steph about his ideas for college, and now everyone thinks he’s dead. Sounds kinda familiar, huh? But that’s where the similarities end. Tim didn’t fake his death and flee the country like Steph did. He’s been taken hostage by Mr. Oz, and we still have no idea why or even how. Steph’s been handling the whole situation about as well as anyone could expect. She’s heartbroken and in mourning, sure, but she’s also got plenty of anger to go around—anger she’s finding it easier and easier to direct at Batman for pushing Tim into a position where self-sacrifice was the only logical conclusion. Without Bruce’s influence, Tim might still be around. And it just so happens, there’s a new group of enemies cropping up on the scene who share in those sentiments. They call themselves “The Victim Syndicate” and they’re willing to violently prove that the presence of the Batman is more harm than good. Now, it’s up to Steph to decide which side she’s on. You can learn how she decides to cope with her grief and her rage in Detective Comics Vol. 2. And if you’re up to date on Detective, then don’t miss Stephanie in today’s DETECTIVE COMICS #957, which finds her struggling with how to defeat a powerful villain without seeking out help from Batman. DETECTIVE COMICS VOL. 2: THE VICTIM SYNDICATE by James Tynion IV, Alvaro Martinez, Eddy Barrows and Ben Oliver is now available in print and as a digital download.